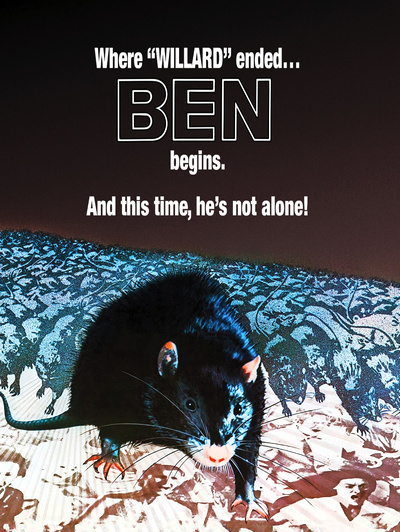 Ben (1972), the sequel to the rat-revenger Willard (1971), picks-up right where the first left off, with a recap of the last few minutes of the first film, with lead rat Ben commanding his horde of rats to kill the treacherous human Willard. The cops have arrived on the scene and are investigating the strange death of Willard Styles, lead by detective Cliff Kirtland (Joseph Campanella). The case proves hard for him to wrap his head around, but they find Willard's diary which sheds some light on the events leading up to his murder, but it still seems impossible to think that a horde of rats are killing people. It becomes easier to believe when a cop left behind to guard the crime scene is attacked and killed by Ben and his vermin-horde, who the unfortunate cop found hiding within the walls.